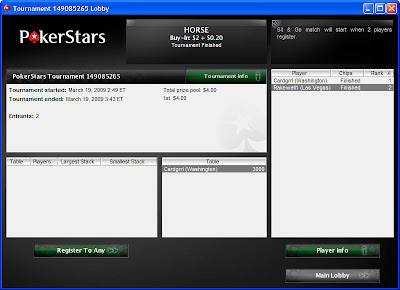 Rather than do another regular single-table HORSE tournament, tonight I issued a challenge to Cardgrrl to play the game mano-a-mano for the princely sum of $2 each, which I had found was the lowest that PokerStars offered for heads-up HORSE STTs. She foolishly accepted. I won the match (as if there were any doubt of the outcome), at which point she requested best two out of three. We had to move to a $5 game for the second one (because Stars only keeps one such table open at a time, and somebody was already seated in the $2 game, waiting for somebody to play with). I won #2 also. Predictably, this prompted a call for "three out of five." *sigh* Oh, the things one must do to be a good sport. Being a gentleman, I totally let her win the next two matches. She will probably tell some other tale of, oh, I dunno, catching quads to my full house, or some such nonsense to explain the outcomes you see above. But just between us, we all know the real truth. Still, in the end, I couldn't bring myself to be so gallant as to deliberately lose the whole series, so I had to put it away in game #5, and claim the title. Total buy-ins: $14.05. Total prize money: $18.00. Net profit: $3.95 for about four hours of play. Excellent! My retirement fund continues to grow apace. I also claimed the bragging rights, which I am exercising to their fullest herein. Actually, this was one of the most interesting things I've done in online poker. Neither of us had ever played HORSE heads-up except at the end of a tournament. It's not immediately obvious how hand values change, what is playable and what isn't, how strong a hand is likely to win, how frequently to bluff, how frequently to call possible bluffs, etc. I found that it often wasn't even entirely clear whether a river bet I was making was a bluff or a value bet. More times that I would care to admit, in the high/low rounds I won just the high when I was expecting to take the low, or vice-versa. Those are strange surprises. Also, because of playing nearly every hand, I found myself falling into predictable, exploitable patterns, and had to make conscious efforts to change things up. When playing only a small percentage of starting hands in a full ring game, there is much less for an opponent to observe, so patterns take longer to become apparent. I found it useful to once in a while deliberate decide that the next hand, whatever it was, I would play either a step more aggressively or a step less aggressively than I would just based on the starting hand value. It must have done some good in sowing confusion, because it was on those occasions that I more commonly got a "Really?" message from Cardgrrl, apparently surprised at whatever action I had just taken (check where she expected a bet, or a raise where she had been anticipating a call or fold). The most amusing part of each game was privately setting an over/under value for the number of hands past the end of Razz that Cardgrrl would discover we were now playing Stud, and, similarly, the number of hands past the end of Stud that she would notice that we had begun Stud/8. Hey, it's not my job to tell her! A fair over/under is three, but she got to five at least once. Those hand histories would look quite, um, interesting, I should think. So now, in addition to being Lord of the $10 HORSE, I lay claim to the title of Master of the $2 Heads-Up HORSE--at least until the grudge rematch gets scheduled. Will you two just get married and get it over with already??? @Ray: Why on earth would I marry someone who can barely luckbox his way to a marginal victory over me? Give me credit for a little selectivity, would you? @Rakewell: " I found that it often wasn't even entirely clear whether a river bet I was making was a bluff or a value bet." I feel confident that any need for a full rebuttal is obviated by this one sentence. À la prochaine, mon ami! @Cardgrrl: Sounds to me like you really have the hots for the Grump. I think Grump just has to be a little more of a man and show you who is boss on the felt. I just love it when I can help bring people together. If you guys get engaged before the big Grump tourney, do I get a free entry?? @Ray: Not if I have anything to say about it. We are going to need every penny for the honeymoon. At the risk of beating a dead HORSE, some readers might be interested in this follow-up report. St. Patrick's Day in downtown L.V. What happened to "Guess the casino"?